Cod is in season from May through to September; if you’re making this outside of these months try using another seasonal white fish such as coley or haddock. Buying seasonal fish means you are buying fish outside of their breeding season and will help to ensure you are buying fish in a sustainable manner. You do not need a food processor for this recipe; using one will just making a finer textured burger ... and less mess! Follow a recipe; follow food safety & hygiene rules; use measuring spoons and cups; chop using bridge/claw safely; snip herbs with scissors; shape e.g. burgers, fish cakes. Measuring cups and spoons, bowl, fork, knife, chopping board, spoon. Mince the fish in a food processor* with the curry paste, coriander, brown sugar, lime juice and fish sauce. Spoon into a bowl, season with pepper and mix in the spring onions. Divide the mixture into 4 and shape the burgers by rolling the mixture into a ball before flattening between your hands. For best refrigerate the uncooked burgers for 2 hours. When you are ready to cook your burgers, grill them at a fairly high heat for approximately 3 minutes on each side, so that the burgers take on a bit of colour on each side and are cooked through. Serve on a toasted burger bun with some seasonal salad. *If you don’t have a food processor finely cut the fish into a bowl and then add the curry paste, coriander, brown sugar, lime juice and fish sauce and mix together. 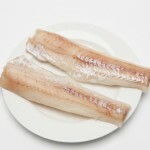 Cod is an excellent source of protein, as well as vitamins A and D. All white fish is low in fat and high in protein. Scientists recommend eating at least two portions of fish a week. Bread is a good source of complex carbohydrates which gives us energy. It is also a good source of fibre and B vitamins. 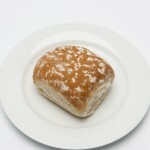 In general, wholemeal bread tend to be more nutritious than white, and it also contains more fibre. Don’t forget your salad vegetables too! One of your 5-a-day.